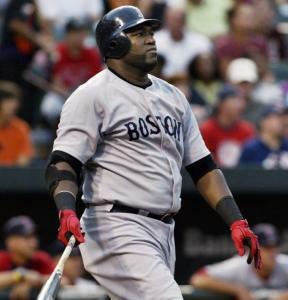 David Ortiz said Thursday that he was “blindsided’’ by the news that he and Manny Ramírez, whose booming bats led the Red Sox to their historic 2004 World Series title, had tested positive for performance-enhancing drugs in 2003. But both players, along with more than 100 others who tested positive, were notified years ago by the players union that they were on a list of players seized by federal authorities along with the test results, according to a landmark report on doping in the sport and testimony by the union chief. The notifications came after federal investigators seized more than 100 names of ballplayers in an April 2004 raid of the two firms that handled the testing of more than 1,400 samples. After the raid, the commissioner’s office and the Major League Baseball Players Association agreed the union would inform those on the list that the government believed they had tested positive. But that notification was delayed for months - so Ortiz and Ramirez would not have been informed that they were on the list until deep into that championship season. According to the report by former Maine Senator George Mitchell, a 400-page assessment of baseball’s doping problem issued in December 2007, the players weren’t told until early September 2004 - just a few weeks before the end of the regular season - even though the list had been finalized in November 2003. The list, which led to a mandatory steroid testing program in 2004, never was intended to be made public. But now that four of the 104 men who reportedly tested positive that year have been identified, including Yankees star Alex Rodriguez and former Cubs slugger Sammy Sosa - the players’ union is doing whatever it can to make sure that no other names seep out, while hoping that a US appeals court in California agrees that the list should remain private. “The leaking of information under a court seal is a crime,’’ Fehr declared Thursday after lawyers involved in the case had told the Times that both Ortiz and Ramirez were on it. The steroid testing, with code numbers matched with names, was designed to be confidential. Comprehensive Drug Testing, a California firm, collected the urine specimens analyzed by Quest Diagnostics, a New Jersey laboratory. Once the union received and tabulated the results after the 2003 season, the list was supposed to have been destroyed, but it was retained in the wake of a grand jury subpoena. The federal investigators reportedly had a warrant to collect the testing records of only 10 players, including Barry Bonds, Gary Sheffield, and Jason Giambi, whom they believed had a connection to the BALCO case, which involved a California supplements firm that provided banned substances to top stars in multiple sports. But the union, which says that the investigators took the files of many more unrelated athletes, sued to prevent the government from using the other names on the 2003 list. The union, which lost its court bid at the end of 2006, took the case to a 9th Circuit appeals panel in California, which heard the case last December and has yet to issue a ruling. “We intend to take the appropriate legal steps to see that the court orders are enforced,’’ Fehr said Thursday. Jack Gillund, a spokesman for the local US Attorney’s office, had no comment yesterday. As lengthy as the list is, it likely includes only a fraction of players who used performance-enhancing drugs that year. The Mitchell Report said that the estimated 5-7 percent rate of positive tests “almost certainly understated the level of use’’ because players knew that they’d be tested and because the test didn’t check for human growth hormone, a less-detectable drug that had become a popular alternative to steroids. Once the government obtained the list, the commissioner’s office and the union agreed to have a moratorium on testing until July 2004, and not to test the players on the 2003 list until they’d been notified. When that hadn’t happened by mid-August, the Mitchell Report said, Rob Manfred, MLB’s vice president in charge of labor relations, urged Gene Orza, the union’s chief operating officer, to have the players informed and tested as soon as possible. Only one positive resulted from that round of tests, the union reported. Since 2005, nearly two dozen major leaguers have been suspended for drug use, most recently Ramirez, who was banned for 50 games in May after testing positive for a banned drug.